It is unclear whether the eruption was caused by fresh magma or, more likely, by an explosion of overheated water (phreatic activity). The incandescence observed at the crater due to hot gas emissions has decreased during 12-13 April and was no longer visible during last night. A new eruption occurred yesterday at the volcano. SERNAGEOMIN reported that at 09:20 (local time) on 3 March degassing became more intense at the volcano. The plumes were sometimes grey colored, suggesting slight ash content. Incandescence was visible at night. Despite this activity, seismicity remains normal. The (official) Alert Level remains at GREEN. The SERNAGEOMIN has pressed the alert level from green to Lascar volcano, although the volcano produces a vapor plume (which may have reached 1200 m high on Feb. 29). Zwischen 1-15 Feb insgesamt 350 seismische Ereignisse oder über 21 pro Tag im Durchschnitt wurden registriert, darunter 233 lang-Zeit-Signale interpretiert, die verursacht werden durch fließende Bewegungen, 8 so genannte Tornillo lange Zeit Beben, davon 148 Sekunden und 3 Impulse von vulkanischen Tremor (evtl. Hinweis auf Magma-Bewegungen) dauerte. Lascar volcano in northern Chile was placed on heightened alert status YELLOW, after SERNAGEOMIN detected a swarm of over 300 small earthquakes between 4 and 5 January. The Buenos Aires VAAC reported that on 11 March an ash cloud from Lascar rose to 5.5-6.7 km (18,000-22,000 ft) a.s.l. and drifted E.
<<Lascar in the Central Andes of Northern Chile started a new eruptive cycle on April 18th 2006, after almost one year of apparent repose (last eruption recorded in May 4th 2005). <br>After one week with several phreatic explosive cycles per day (some lasting up to two hours), reaching up to 3,500 m above the crater, the activity decreased. The ash collected in June around the crater area showed no signs of new magma, in agreement with seismic data (three seismometers were installed for one week, and one for nearly one month to record the seismic activity associated to the explosions). 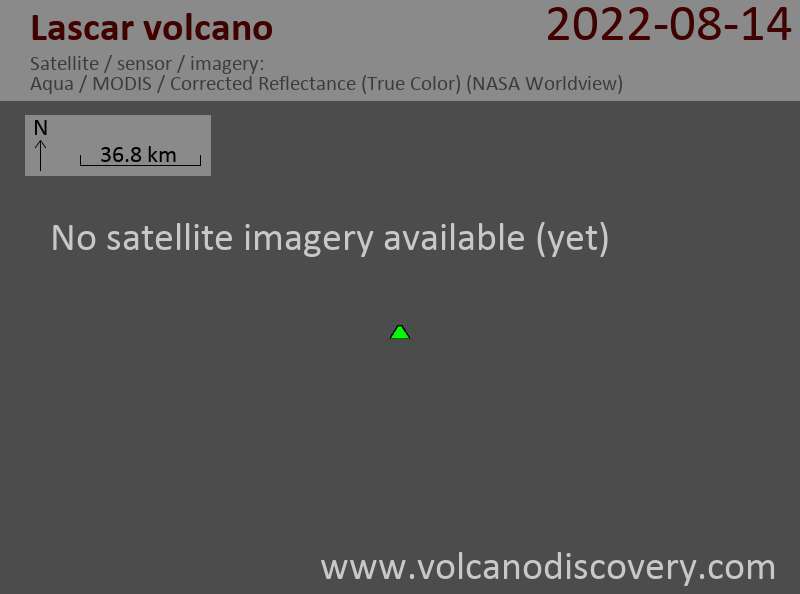 The volcano has continued its activity with several smaller explosions during May, July and August, although much more separated in time (up to several weeks). The last observed explosions occurred on June 12th at 16:00 hrs and August 14th at 18:00 hrs (local time, GMT-4)). The latter lasted for 5 minutes and the plume reached up to 450 m above the crater, and was rapidly dispersed towards the East-Southeast. This unusual long-lasting cycle of phreatic vulcanian explosions of Láscar volcano seems to continue, and efforts from the Chilean Geological Survey (Sernageomin) and the Chilean Emergency Office (Onemi) are under way to install permanent seismometers in the area. "Lascar volcano ... started an eruptive cycle on April 18th 2006 at 11:35 hrs (all are local times). Four explosions were recorded on the 18th, one rose up to 3,000 m above the active crater. Two explosive cycles were observed on the 19th starting at 11:20 hrs and 13:21 hrs, the second being the largest rising up to 800 m above the crater. The plume, which essentially consisted in gases with little ash, was dispersed towards the north. Fine ash fell on the northern upper flank of the volcano within a radius of 3 km. Two new explosive cycles were observed on April 20th starting at 11:05 and 13:39hrs. The latter has been the longer observed so far, lasting 1 hour and 53 minutes. The plume consisted mainly of gases and little ash, rising up to 2500 m above the crater and dispersed towards the N at the beginning and at the end of the cycle towards the NE. Fine ash was deposited on the upper northern and eastern flanks. Finally two new, but smaller, explosive cycles were observed today starting at 08:48 hrs and 11:42 hrs, lasting less than 15 minutes each, with an eruptive column rising up to 3000 m above the crater, similar to those of the previous day, but dispersed towards the westand SW, respectively. These phreatic explosions show an unusual behavior of the volcano, and there is no evidence so far of new magma reaching the surface. Preliminary seismic data obtained by the Chilean Emergency Office (ONEMI) show only seismic events related to shallow degassing, without any seismic event associated todeeper fractures or magma movements." Lascar's eruption on 18 April 2006 (Photo REUTERS). Lascar volcano IN TheCentral Andes (Northern Chile) started erupting on Tuesday morning (18 April, 2006). A column of steam and ash rose to about 3,000 m (1,864 miles) above the summit crater. Lascar volcano erupted last week, as the Buenos Aires VAAC reported: seen on satellite imagery early on 4 May, Lascar volcano in Chile sent an ash plume into the 4.5-10.6 km a.s.l. range (15,000-35,000 feet), where it was moving to the SE. Background. Lascar is the most active volcano of the northern Chilean Andes. The andesitic -to- dacitic stratovolcano contains six overlapping summitcraters and lies 5 km W of an older, higher stratovolcano, Volcán Aguas Calientes. Lascar consists of two major edifices; activity began at the eastern volcano and then shifted to the western cone. The largest eruption of Lascar took place about 26,500 years ago, and following the eruption of theTumbres scoria flow about 9,000 years ago, activity shifted back to the eastern edifice, where three overlapping craters were formed. Frequent small-to-moderate explosive eruptions have been recorded from Lascar in historical time since the mid-19th century, along with periodic larger eruptions that produced ashfall hundreds of kilometers away from the volcano. The largest historical eruption of Lascar took place in 1993 and produced pyroclastic flows that extended up to 8.5 km NW of the summit.